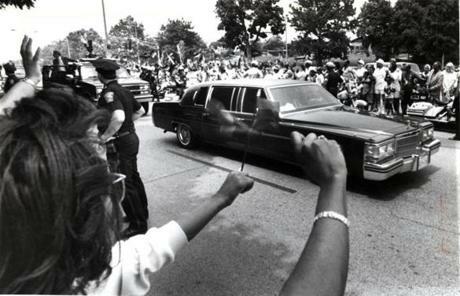 June 23, 1990: Spectators greeted the limousine carrying Nelson Mandela on Martin Luther King Boulevard. 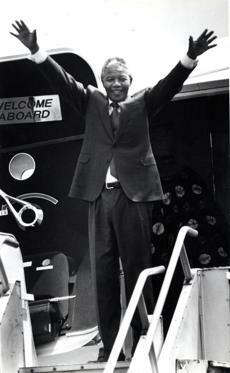 During a whirlwind tour through Roxbury and Dorchester, the Mandelas were welcomed as heroes. Thousands lined the streets and waved the African National Congress's black, green, and gold flag. Others placed pictures of the Mandelas in their windows. 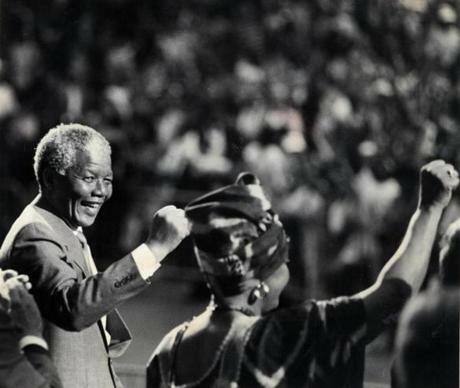 June 23, 1990: Nelson Mandela acknowledged the cheers after his speech at the Hatch Shell. His then-wife Winnie is at right. His remarks praised Boston and Massachusetts for their fight against apartheid. "It is with boundless joy that we speak to you today. We embrace each and every one of you. Sisters and brothers, my delegation, my wife and I are deeply moved by the warmth and love that your city has accorded us. We are even more touched that it was here in Boston that your own independence movement got its birth. Your love and enthusiasm as well as your pioneering role in taking positive measures against apartheid portray a deep feeling of kinship you hold towards our people and the just cause that they are so vigorously fighting for. When one day our history is rewritten, the pioneering and leading role of Massachusetts will stand out like a shining diamond. It was you who supported us when very few knew of our existence, our trial and tribulation." 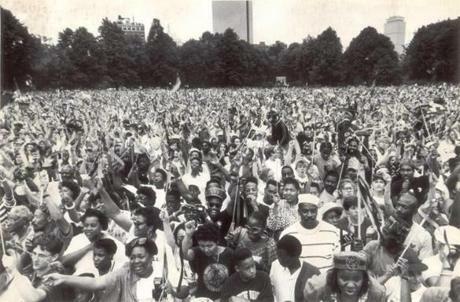 June 23, 1990: The crowd of people, estimated at 250,000, at the Hatch Shell sang the national anthem of the African National Congress, the leading antiapartheid group in South Africa. June 23, 1990: Dancing to the finale music after his speech at the Hatch Shell on Boston's Esplanade, Nelson Mandela was flanked by Senator Edward Kennedy and Mayor Raymond Flynn. Musical performers included South Africa's Johnny Clegg & Savuka and Ladysmith Black Mambazo, as well as Paul Simon, Jackson Browne, and Stevie Wonder. Local performers included the Boston rap group Young Nation, gospel singer Larry Watson, the Roxbury Presbyterian Choir, and soloist Linda Chorney. June 24, 1990: Nelson Mandela waved goodbye to Boston from the airplane doorway. Mandela's six-week, 13-nation tour was designed to raise awareness of the antiapartheid struggle of South African blacks and to raise money for the African National Congress. It was Mandela’s first visit to the United States since he was freed in February after 27 years as a political prisoner in South Africa. 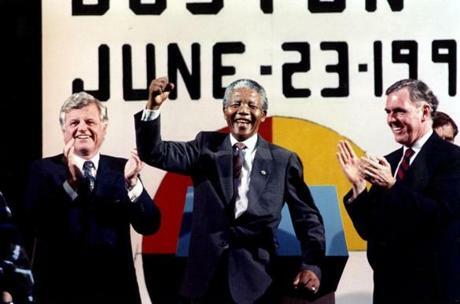 Boston was Mandela's second stop after New York and more than $ 500,000 in contributions were raised here for the ANC.